In working areas of Telangana, AME Foundation helped farmers harvest better yields of Redgram through the Farmer Field School approach. FFS farmers harvested on an average 6.5 q/ac of Redgram while it was 4.5 q/ac through traditional method by adopting LEISA practices. With enhanced production, the farmers planned to have a dal mill to process the grain. To assess the various mills, farmers were taken to Wardha in Maharashtra to check and choose the machine suitable for them. 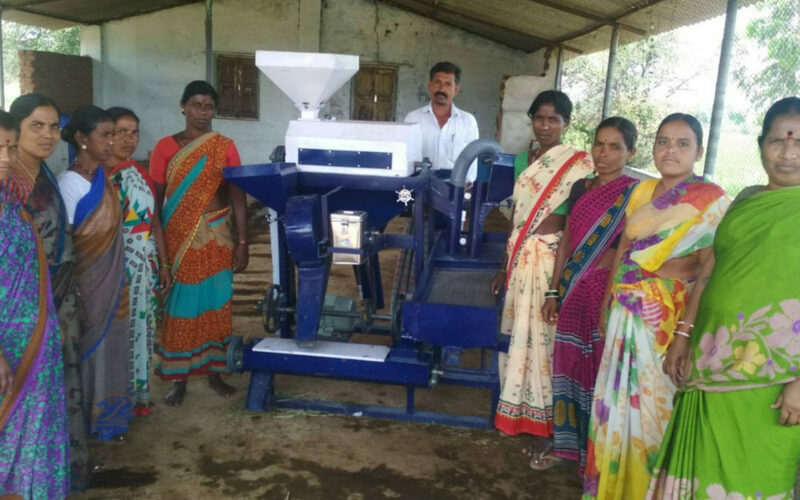 Following the assessment trip, the woman SHG in Kasalabad took the initiative to set up the dal mill, by contributing a part of the total cost of the machine. Presently the mill is being managed by the SHG. For every kilogram of dal processed Rs. 3 is being collected as service charge. The wastage from the unit is being sold to dairy centers for feed at the rate of Rs.8/kg.